Olivia Margaux: Wedding Wednesday: My Sister is Engaged!!!! 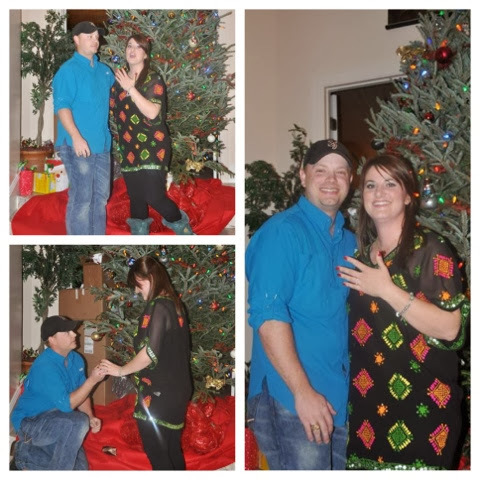 Wedding Wednesday: My Sister is Engaged!!!! This post is super late. However, my pictures were stuck on my camera and I didn't want to post it until I had them. Visuals make it even better. I also wanted Sam's permission to share her proposal story and she said yes. Thank you Sam for letting me tell the tale! It all started the day after Christmas when Cody asked my parents's for their permission/blessing to ask Sam to marry him. They both said yes of course, and then I was just waiting to see if it would happen while we were home. The next day, after spending approximately 10 hours in the truck hunting, we were getting ready to go to dinner. We being Linda, my dad, Josh, Sam, Cody and me. Cody pulled me aside and asked me if he could speak to me. I said of course and at first thought something was wrong. Well it turned out he was ready to ask Sam right then and had a plan. He asked me to get out my camera right before we were leaving and have him take pictures of Josh and myself. Then when he finished I would return the favor and take some pictures of Sam and him in front of the Christmas tree. During the "photo session", he would pop the question. I loved the idea and put my poker face on (which was really hard). As we were gathering our purses and things to head out the door, I got out my camera and Cody took some pics. Then, just like we planned, I took the camera and told him and Sam to get up on the stairs for some pictures too. My heart was beating so fast as they started posing. I was so nervous and I wasn't even the one asking the biggest question to the person I loved. I can't imagine how Cody must have been feeling...or Josh for that matter back in July. Boys have the harder part in the proposal scenario that is for sure. Any who, as they were posing for pics, Sam made a comment about how she didn't have a ring and posed "ringless". The timing couldn't have been better. At that moment, Cody got down on one knee. Sam thought he was kidding at first, but then Cody pulled out the ring. He said some of the sweetest things to Sam, told her he loved her, and then asked the big question....and Sam said YES!!!!! I couldn't be happier for you both. Sam you are the best sister I could have ever asked for, and Cody, welcome to the family! Love y'all soooo much! Aww that is such a great engagement story. Congrats to them both! Awww nice job to Cody! Congrats and Best Wishes to them! My goodness two of you engaged at the same time! That's so wonderful!! !